Awana is a nondenominational ministry that assists churches in reaching children and teenagers with the gospel of Jesus Christ and training them to serve Him. 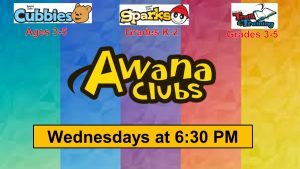 Awana Clubs International supplies programs, materials and training for more than 12,000 churches in over 110 countries. Their message to churches is simple: We’re here to serve you with a ministry that is all about fun with a purpose to win and grow kids for Christ! Just a friendly reminder to get out and vote today, August 7th, in the Michigan Primary. Jesus is coming soon! Come join us as we learn about His return this Sunday, August 5th at 9:30 am! I Thessalonians 4:13-18. Looking for a church family? We'd love to have you visit with us this Sunday at 9:30 am for our weekly Celebration Service. Come and see why we claim to be "A Family for You". Join us this Sunday, July 29th, as we continue our study in I Thessalonians!